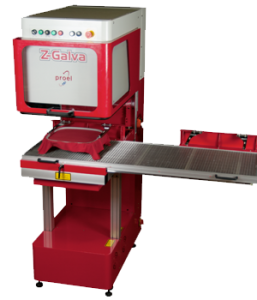 The Z Galva Standalone Laser, now offered by BITO, has a laser head with Z-axis movement and a variety of attachments that allow it to be used in a multitude of applications. It can be used for a wide range of textiles, including embroidery appliqué and certain rigid material such as plastics. With higher wattages, it can cut leather, other tough materials, mark wood and synthetics, and other hard substrates. It features an advanced frame design that allows the galvanometric scan head to hover freely over the work area with the ability to rise or drop to accommodate various heights and objects. Attachments can be switched out from the center area of the machine, depending on the application.